Thanks to memecenter.com for this awesome meme. To (aspiring) Christian leaders- if I can tell you one thing that will come during your leadership, it is disagreement. People will disagree with you. Some people may not like the way you do a certain thing, your views on a certain area, or your approach to an issue. This is inevitable. People aren’t going to like every single thing you do. Get used to it. That doesn’t mean you have to throw a tantrum any time somebody thinks you’re wrong. Being wrong doesn’t mean you are a terrible leader. The fastest way to prove that you’re a bad leader is by responding poorly. One of the best ways to show that you’re a good leader is to respond to criticism with grace, understanding, and wisdom. There are a couple different ways of dealing with disagreement. It’s easy to become angry when somebody disagrees with you. It’s easy to buy the lie that if somebody disagrees with you, they dislike you. They very well might, but generally we should separate disagreement from dislike. James 1:19-20 tells us that the proper response for a Christian includes being “quick to hear, slow to speak and slow to anger.” Anger only stops us from hearing what the other is saying: don’t let your pride stop you from hearing what God may be saying to you through the other. It also can offend someone very easily. It also makes you look like a jerk and can alienate you from many Godly relationships. And it can make people hate you. Just sayin. It’s discouraging when somebody disagrees with you. But it doesn’t have to be. Instead of letting yourself be discouraged when somebody disagrees with you, see it as a time to grow. The other person may be genuinely crazy and be completely wrong. But it’s not very likely. Much more likely is that they have a legitimate concern. Be quick to hear it, and see it as God using people to push you in the right direction. You should pray, weigh their opinion against scripture, and consider the context and the consequences of their critique. You may come to the conclusion that they were wrong. But you should be encouraged that you grew closer to God by praying through it, studying the scripture, and approaching the situation with a gracious heart. I consider myself incredibly blessed to have a leadership team that is far more experienced and practiced at Youth Ministry than I am. In fact, I have leaders on my team that have been in youth ministry longer than I’ve been alive. That is a challenge at times- but I respect so much their willingness to submit to my authority (those crazies!!!!) and trust God’s guidance for bringing me into ministry where I am. That said- when my leaders, church members, or others feel the need to say something to me, I listen. I often come to a different conclusion than they do, but by goodness I’m going to listen. I may view ministering to students in our context differently than they do based on a number of factors- life experience, growing up with students like we’re ministering to, etc. but God brought these leaders and church members into my life to teach me as much as I’m supposed to be “leading” them. Every time there is a disagreement, even though I may not agree about the issue at hand, I can still grow by submitting to their God-directed concerns. I can still see it as a chance to grow in grace. I can still use it as an opportunity to lovingly disagree. 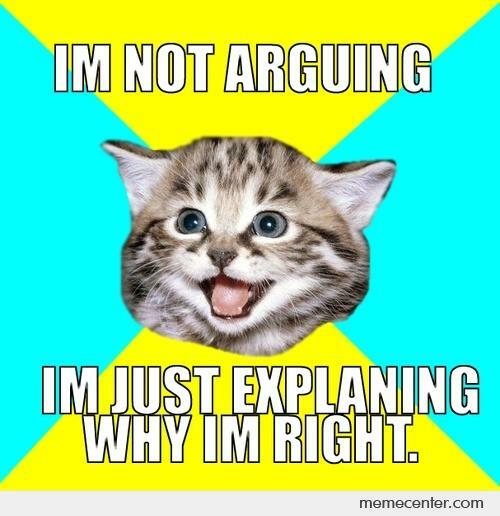 What are some ways you deal with disagreement? Are there constructive ways that you deal with it? Destructive? Any stories you’re willing to share of times where you grew through disagreement?